BARIATRIC LOW AIR LOSS MATTRESS SYSTEM 42"
Home>Low Air Loss Mattress >BARIATRIC LOW AIR LOSS MATTRESS SYSTEM 42"
This bariatric low air mattress provides all of the benefits of the advanced low air mattresses. 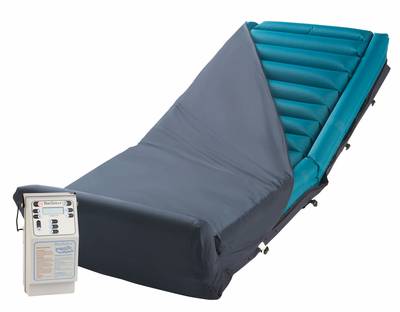 This baratric low air mattress loss offers a higher weight capacity (700 lbs) , a larger width, and a digital screen for entering the patient's weight. The pulsation mode provides alternating pressure to heal and advanced stage sores. True low air technology protects the skin from heat and moisture. The user friendly pump is designed to produce a steady flow of air that keeps the patient cool and dry for optimal skin protection and comfort. This elite mattress is commonly used in hospitals and is ideal for home health care. This low air loss mattress system is designed for bariatric patients with chronic pain, bed sores, pressure relief, and or severe burns. This bariatric low air mattress is the highest rated for comfort and the best on the market today for healing.